Thanks to the location of the castle at the center of the property, the grapes reach the cellar in just a few minutes to be quickly and gently pressed and put to ferment in small quantities at a controlled temperature. The ancient cellars date back to the XVIth century. Aging takes place in Slavonian oak barrels placed along the corridors, protected from sudden temperature changes. 3 years old oak barrels of 30 hl. 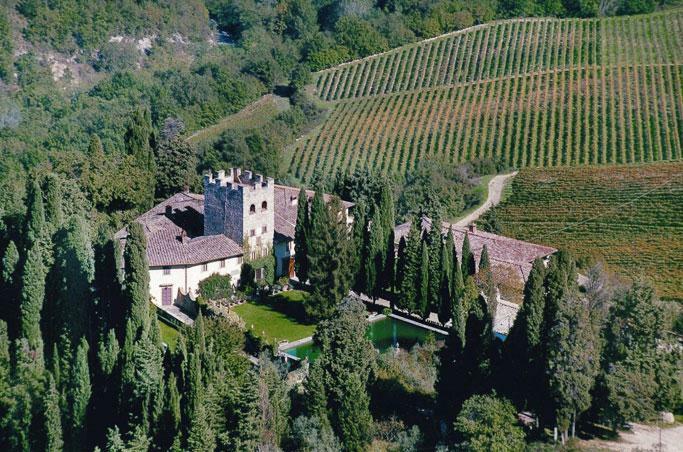 capacity are used for the elevation of the Chianti and Chianti Classico Riserva, and new barriques (Allier and Vosges) for the elevation of Chianti Classico Gran Selezione Sassello and of the Super Tuscan Bottiglia Particolare. By visiting the winery, surrounded by the scents of fine oak barrels, one enters into the heart of the castle, where selections of the best vintages since 1924 are kept. Remained unchanged within its boundaries for over 1000 years, the estate of 230 acres owns 52 hectares of vineyards at altitudes between 260 and 420 meters above sea level, in a stony soil rich in limestone. The vineyards are periodically renewed according to a program that keeps the average age of the plant around 12 years. Types of farming are the traditional ones used for the territory of Chianti Classico, which is the horizontal spurred cordon decking at 60 cm from ground level, and Guyot. The existing 52 hectares of vineyards are divided into single vineyards located on the more suited ground with the best properties and microclimate. The grapes used are mostly red grapes, among which Sangiovese clearly stands out, along with other varieties including Merlot, Canaiolo, Cabernet Sauvignon and Colorino, and only a small percentage of white grapes like Trebbiano Toscano, Traminer and Malvasia lunga del Chianti. The excellent climatic conditions of vineyards, combined with improved farming techniques aimed at obtaining a better phyto-sanitary state plant of the grapes, and the limited production yield per hectare (about 60 quintals of grape) enable to produce fine wines, characterized by the maximum expression of the terroir-vine combination. A completely organic fertilization and the agronomic techniques adopted, including the practice of "grassing" aim at a rigorous respect for the environment and its balance. The harvest, which usually take place between September 25th and October 25th, is done exclusively by hand through a careful selection of grapes.